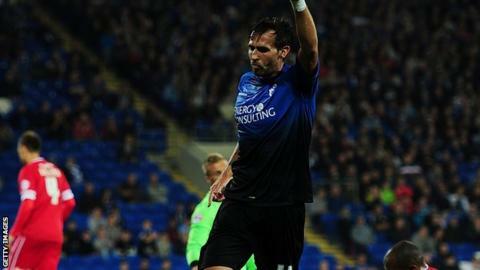 Charlie Daniels scored his only goal of the season in Bournemouth's League Cup win at Cardiff in September. Bournemouth defender Charlie Daniels has signed a new two-and-a-half-year contract with the Championship leaders. Daniels, 28, joined the Cherries in November 2011 from Leyton Orient, initially on loan, and has been a key figure in manager Eddie Howe's side. The left-back has made 21 appearances for Bournemouth this season, and over 100 for the club in total. "I want to play as high as possible and hopefully that's in the Premier League with Bournemouth," said Daniels. The former Tottenham trainee moved to the south coast on a permanent basis in January 2012 and his previous deal was due to expire next summer. "I am really pleased it's sorted, especially with there being only six months left on my contract," he told the club website. "It was a bit of a nervy time these last few months so I'm glad it's all sorted. "The reason why I signed here was Bournemouth gave me the plan of what they wanted to achieve and I wanted to be a part of that. "We are top of the Championship and that's where we want to be and that's where we want to stay."